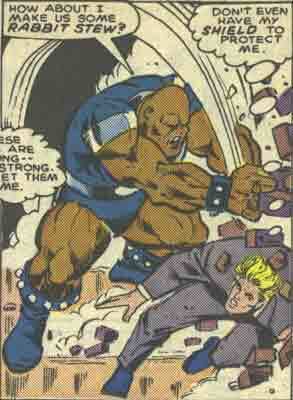 Group Membership: Fangs, Power Broker Inc.
Powers/Abilities: Bludgeon received enhanced strength and durability from the Power Broker treatment. As an operative of the Viper, he wielded a number of large, powerful guns, and wore a jetpack. History: (Captain America I#328) - Bludgeon joined his partner Mangler in attacking Captain America after he attempted to infiltrate Power Broker Inc. as a potential client. Despite their superior strength, Captain America was able to avoid their blows, and escape through a hole they smashed in a wall, only to be stopped by one of Malus' guards. When Captain America didn't return, D-Man followed him in and faced Mangler and Bludgeon in combat, besting the two of them. (Captain America I#363/2) - Bludgeon joined Mangler in forcing Priscilla Lyons, the Vagabond, into the limousine of Dr. Malus, so that Malus could coerce her into obtaining the handprint of the Power Broker for him. (Captain America I#364/2 - BTS) - Vagabond obtained the handprint, but demanded that Malus leave Mangler and Bludgeon behind in order to obtain it. Vagabond managed to defeat Malus, and then phoned the U.S. Agent to inform him of the whereabouts of Malus and his men. (Captain America I#419) - Bludgeon later became an operative of the Viper, and served as a chief member of her Fangs, even leading the team in her absence. When the Viper was tortured by the Red Skull's Iron Monger for information on her terrorist plot, Bludgeon joined the Fangs in attacking the Iron Monger, killing him. They then brought Viper to the broadcast station where she planned to unleash a broadcast which would blind all Americans watching television. When Captain America, Battlestar and SIlver Sable invaded their grounds, the Viper sent Bludgeon and the other Fangs to stop them. Bludgeon attacked Battlestar with his gun, only for Battlestar to deflect the shots at his teammates Razorblade and Heat-Ray. Bludgeon then abandoned the gun to face Battlestar in physical combat, but during the melee, he was accidentally slashed in the chest by Razorblade. 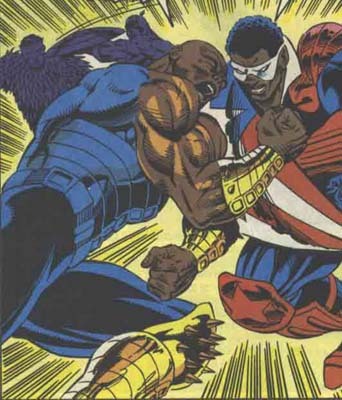 Ultimately, Captain America used Bludgeon's gun to destroy the Viper's broadcast tower, ruining her plot. Comments: Created by Mark Gruenwald, Paul Neary and Vince Colletta. His real name was revealed in Viper's profile in OHOTMU A-Z HC#12.